Conference: "Belfast, Brexit, and Beyond: How will Brexit Affect Politics and Peace in Northern Ireland?" On this 20th anniversary of the signing of the 1998 Belfast ‘Good Friday’ Agreement, the United Kingdom is in the process of implementing its referendum decision to leave the European Union (EU). 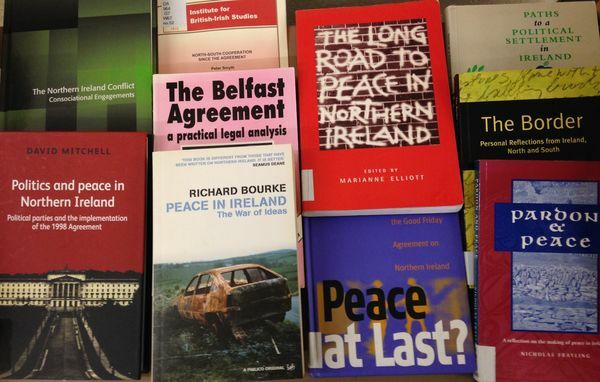 How will Brexit impact the 1998 Agreement and the peace it forged? Mr. Mulhall served as Ireland’s Ambassador in London during the referendum on Brexit. Previously, he served as Director-General for European Affairs for the Department of Foreign Affairs and Trade and as Press Counsellor for the Department as part of the Irish Government’s delegation to the Good Friday Agreement in 1998. Kevin O’Malley, American lawyer and diplomat. Mr. O’Malley was the United States Ambassador to Ireland from 2014-2017. Before assuming his post, he was a federal prosecutor and then a partner at Greensfelder, Hemker & Gale, P.C. in St. Louis, Missouri. Please note: On Monday, April 16, at 7:00 p.m. in Room 1030 Jenkins Nanovic Halls, the Keough-Naughton Institute will hold a “Students Only” event — screening the film Some Mother’s Son (1996). Directed by Irish filmmaker Terry George and starring Helen Mirren, the film is based on the true story of the 1981 hunger strike in the Maze Prison, in Northern Ireland. Bríona Nic Dhiarmada, Thomas J. & Kathleen M. O’Donnell Professor of Irish Studies and Concurrent Professor of Film, Television, and Theatre, will introduce the film and lead a discussion following it that will provide history and insight into the conflict in Northern Ireland. (1) The CAIN (Conflict Archive on the INternet) website contains information and source material on “the Troubles” and politics in Northern Ireland from 1968 to the present. (2) Katy Hayward, BORDERING ON BREXIT: Views from Local Communities in the Central Border Region of Ireland / Northern Ireland." (3) Etain Tannam, "Brexit and the British-Irish Relationship,” Dublin City University’s Brexit Intsitute. (4) Jonathan Tonge,“The Impact and Consequences of Brexit for Northern Ireland,” Briefing for the European Parliament.